Social networks are now so well established, that there is a core 'top five' social networks that don't change much from year-to-year. 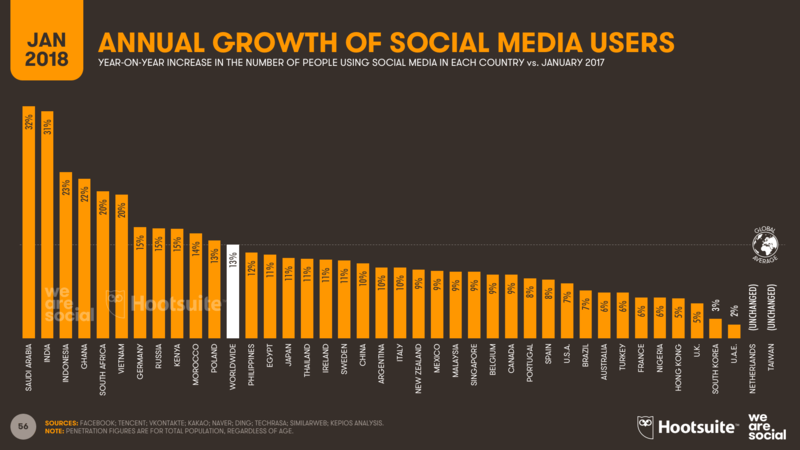 But, as we'll see in this post, the most popular social media sites vary a lot by level of usage in different countries and demographics. Understanding these differences in popularity of different social networks is really important when targeting specific audiences. When comparing the most popular social networks it's best to review them by active account usage, not just the number of user accounts. We'll also see in this summary that some social networks are growing more rapidly than others while some are now in decline. We'll keep this post updated during 2019 as the latest statistics are published drawing on our recommended top 10 digital marketing statistics sources. We'll be pointing to new data around social media channel penetration in the US from Pew Internet and Global Web Index. Since it is still early in the year, many graphs will use the most recent data from 2018 until new research from 2019 is released. Facebook remains one of the most powerful social media platforms for connecting with customers and growing your online following. Download our free cheatsheet to both Facebook and Google Ads to learn how you can use them promote your brand. Q1. What is the overall popularity of Social Media globally? Each year, near the start of the year, We Are Social update their massive global compendium of stats which gives some great insights into the world of social media. It's a great download for presentations. It's particularly interesting how far some countries are diverging in terms of social media use, and surprising that Western Countries are actually lagging a fair way behind in adoption rates. The number of internet users worldwide in 2019 is 4.388 billion, up 9.1% year-on-year. 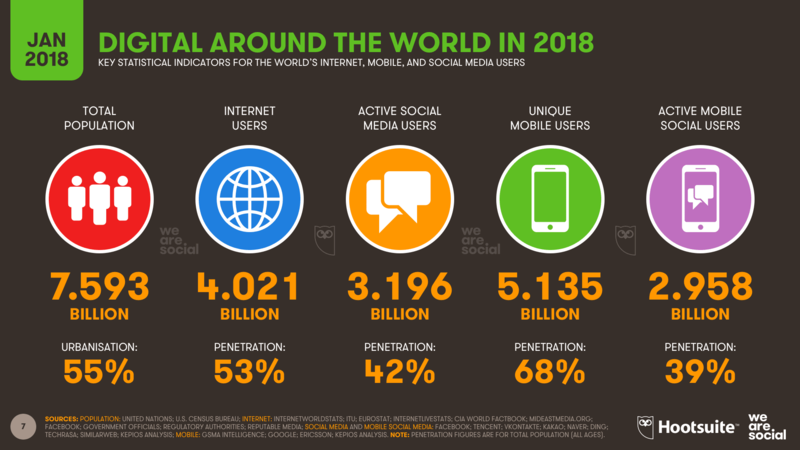 The number of social media users worldwide in 2019 is 3.484 billion, up 9% year-on-year. The number of mobile phone users in 2019 is 5.112 billion, up 2% year-on-year. 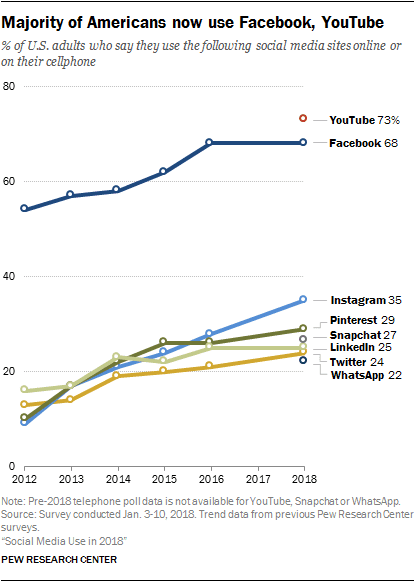 Annual growth continues apace, especially in active mobile social users - 42% penetration up 3% from 2018. Share of web traffic by device highly favours mobile at 52% (staying stable year-on-year), whilst Desktop remains in second place with only 43% of device share to all web pages. 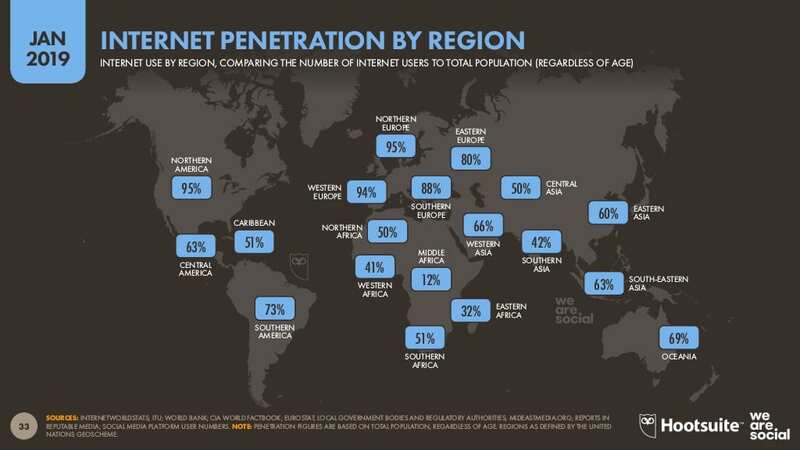 Northen, Western and South Europe and North America have the largest internet penetration with between 88%-95% internet users compared to the total population. Of these, South Europe has seen the biggest increase in internet penetration, with a year-on-year increase of 11%. 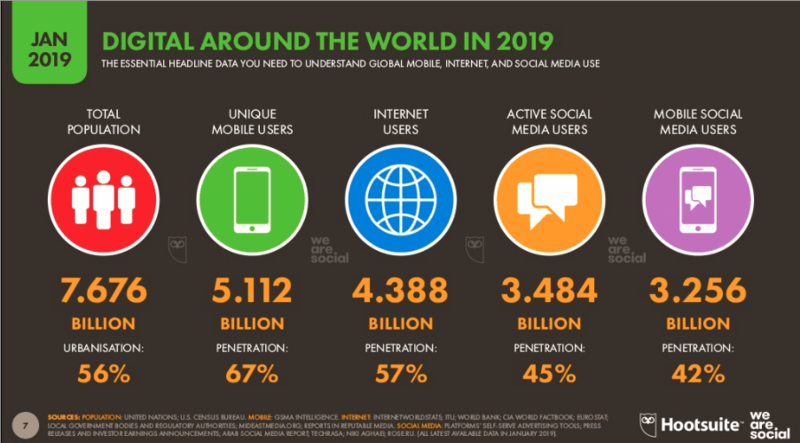 The global increase in social media usage since January 2018 is 9%. 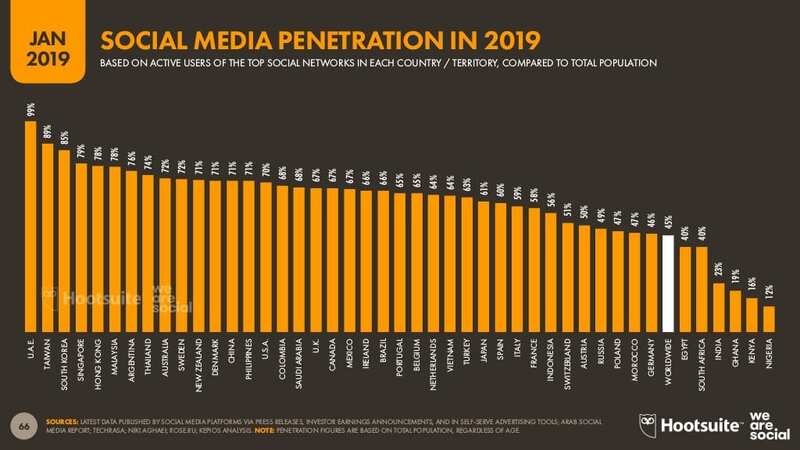 Saudi Arabia has the largest social media penetration in 2019 at 99%, which is well above the global average of 45%. 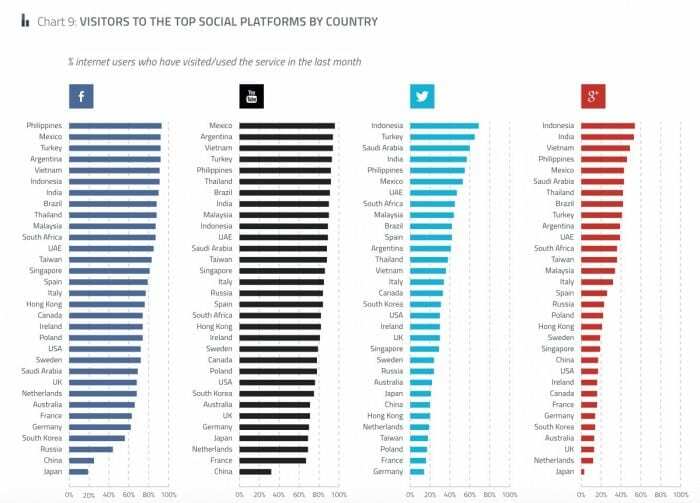 Other countries with the largest social media penetration include Taiwan, South Korea and Singapore. Ghana, Kenya and Nigeria have the lowest levels of social media penetration. With Facebook having the most daily active users compared to other social networks it's important to know how your content may potentially perform and what features to use to optimize the reach of content. There is an 8% average post reach vs page like (down by 2.7% year-on-year) and 27.1% average paid post reach vs total reach. Facebook is a great social platform for organic and paid opportunities with a huge potential reach, although recent algorithm updates have seen organic opportunities to decline. It is now more important than ever to target Facebook content to business personas to gain quality leads. The full report from we are social contains a massive amount of data across 200+ slides. It provides country-specific data for the vast majority of the world, so you might want to check out the slides of the countries in your core markets to get a better idea of the current state of social in the areas you operate. Q2. 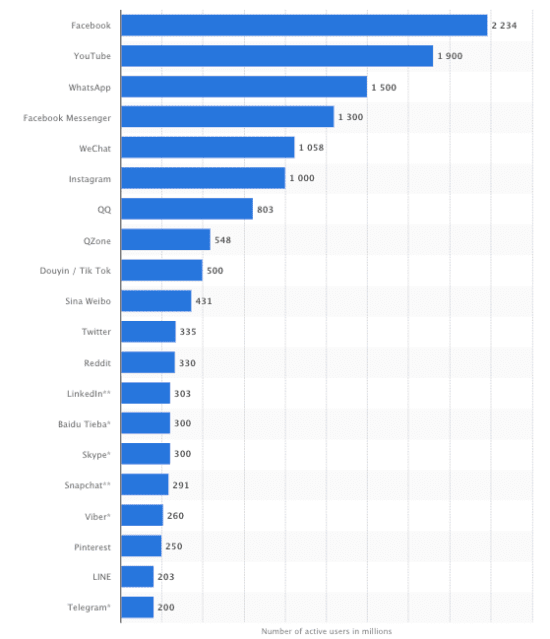 Which are the most popular social networks? 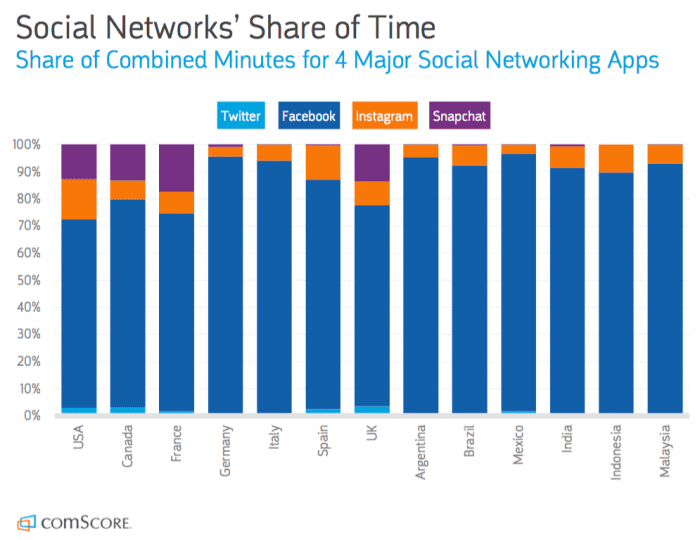 The latest insight from the comScore panel in their 2018 Global Digital Future in Focus compares the popularity of social networks by share of time gives this data based on their home panel for the US, Canada, France, Germany, Italy, Spain, UK, Argentina, Brazil, Mexico, India, Indonesia, Malaysia. We have more detailed information on the UK and the US later in this article. You can see this is a sea of Facebook blue, so this shows that despite the negative media hype about Facebook it is going to remain a major audience channel for some time. In the UK you can see that Instagram accounts for around 10% of social media minutes, so if you are not already exploiting the latest Instagram ad techniques, then it's worth looking into these, see our digital media cheatsheet for more details. Following from this, we have predominantly APAC favoured platforms, with QQ, WeChat and Qzone all with over 600 million active users, highlighting the array of social platform offerings in the APAC. We then see a cluster of predominantly western social media networks in Tumblr, Instagram, and Twitter. The latest OfCom Communications Market report gives this summary for the most popular UK social networks as of March 2018. 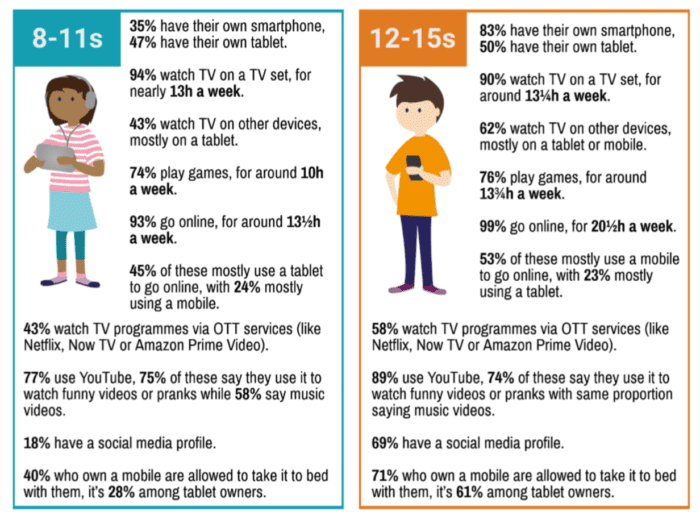 A new 2019 Children and parents: media use and attitudes report also published by OfCom (UK) is interesting if your business is involved in marketing to children or youth markets or you want to understand future adult use of social media. It highlights the continuing decline of Facebook use by younger demographics with 12-15 year olds with a Facebook profile decreasing from 40% in in 2017 to 31% in 2018. Instagram increased from 14% to 23% in the same period with Snapchat fixed at 31%. Here's a snapshot of two of the four age groups featured. Q3. Which are the fast-growing social networks? Every marketer has limited time for social media marketing, so which fastest growing social network should you focus your efforts on? 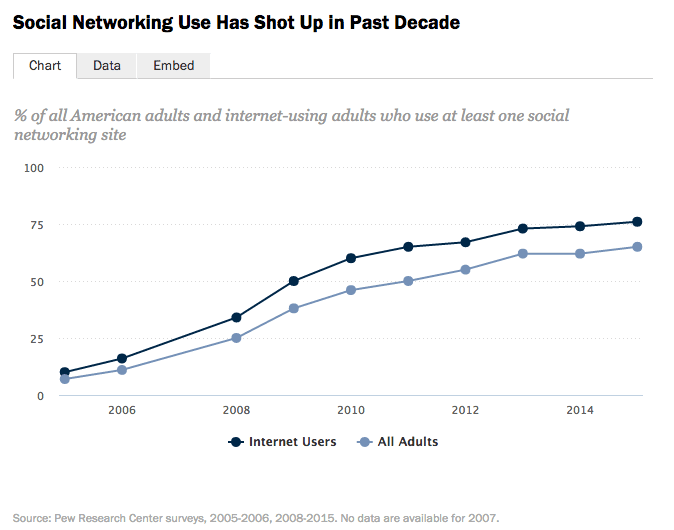 This Pew Research Internet Survey data on gives more detailed insights on US social media usage and growth rates. 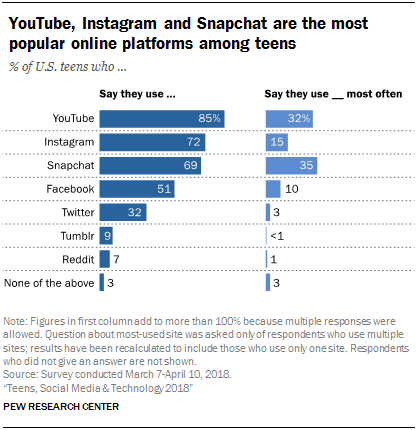 It also reports social media teen use in US from a report Teens, Social Media and Technology 2018. In 2019 Pew has so far reported on perceptions of profiling on Facebook. 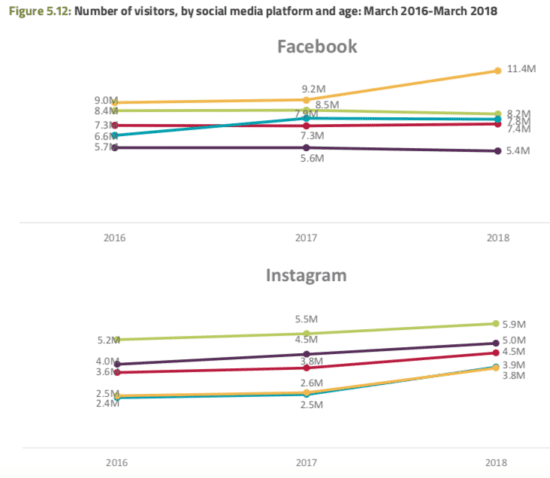 This comparison of changes in monthly active users shows that although Facebook is declining in some demographics such as 18-24 and 25-34, it and Instagram are still growing rapidly overall. Snapchat has also had significant growth. Q4. How do social users interact with brands on social? Knowing how to behaviour / post on social media is also important as this is reflective of your brand personality and consequently influencers social uses to buy or unfollow! Social media is increasingly being used as a customer service platform where customers and potential customers want answers quickly and in real-time. 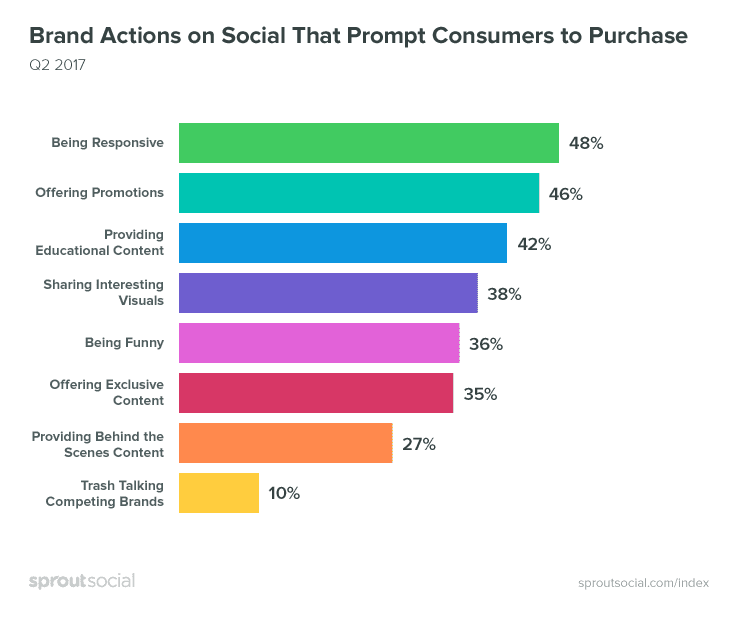 Only 27%of social media user respondents will be prompted to purchase products after seeing behind the scenes content shared on brand social pages. 51% said that they would unfollow brands on social media if they posted irritating posts and 27% said they would mark/report the brand and page as spam and block them. This is why posting relevant, interesting content that resonates with your target audience and social users is important in retaining your Reach and Engagement with potential customers. Q5. 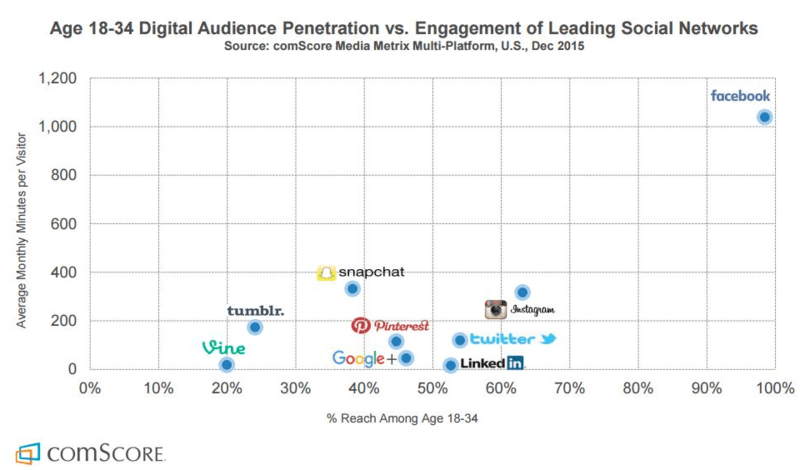 Which is the most engaging social network? Another factor which determines the time we put into social media marketing is the engagement of the audience. 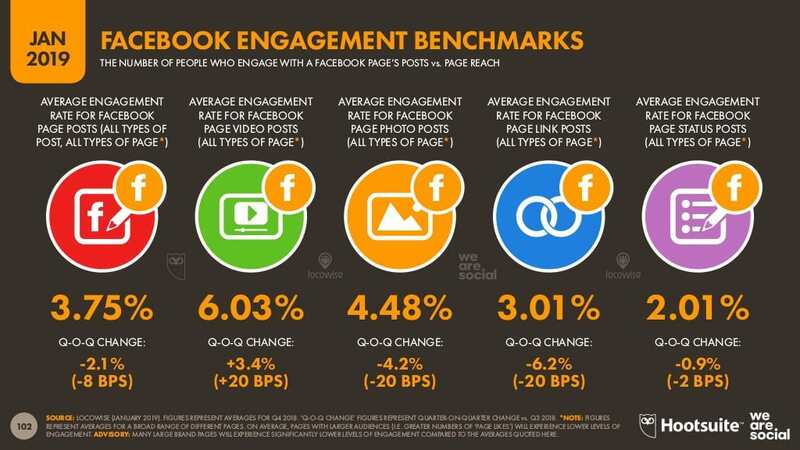 Here we again see the dominance of Facebook - it's also got the greatest engagement in time according to this insight from the US consumer panel from comScore. 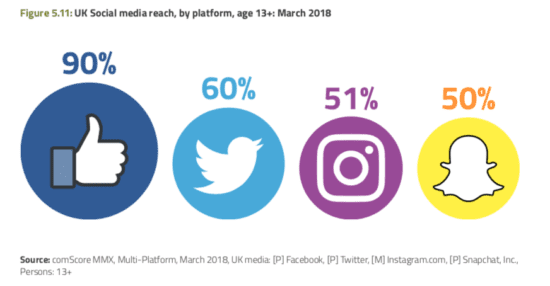 comScore has also published a more recent update on engagement in the UK comparing Facebook vs Twitter vs Instagram vs Pinterest vs Snapchat. The above chart from Comscore shows engagement in terms of time spent on the platform vs reach among the millennial demographic. It's interesting to see how effectively Facebook dominates, but also interesting to see how well Snapchat and Instagram are doing in terms monthly usage per visitor. For more Snapchat stats, see our post on Snapchat Marketing Statistics. Facebook's dominance is truly extraordinary. Not only does it take the top spot, it's other platforms also take 2nd and 3rd respectively. 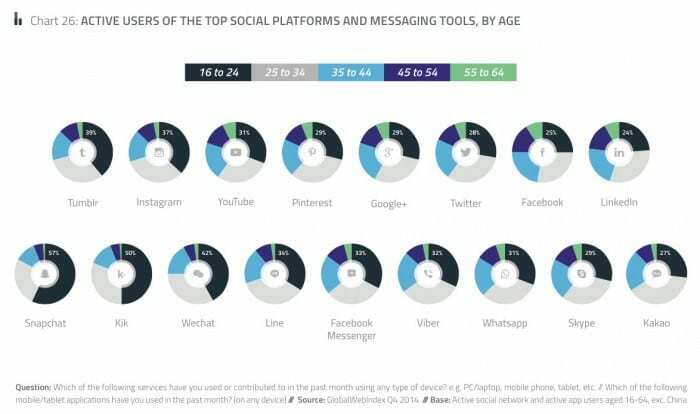 Facebook Messenger has an impressive 47 penetration, and Instagram (also owned by Facebook) comes 2nd for engagement. 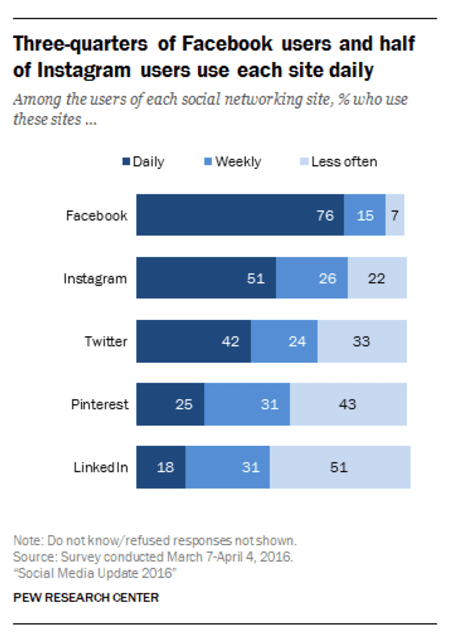 In this recent chart from Pew Internet below, we can see in terms of active daily use Facebook is also in the lead. 76% of users log in daily, whilst 51% do for Instagram (owned by Facebook). Twitter manages just 42% of users login in daily, only just over half the Facebook figure. Q6. 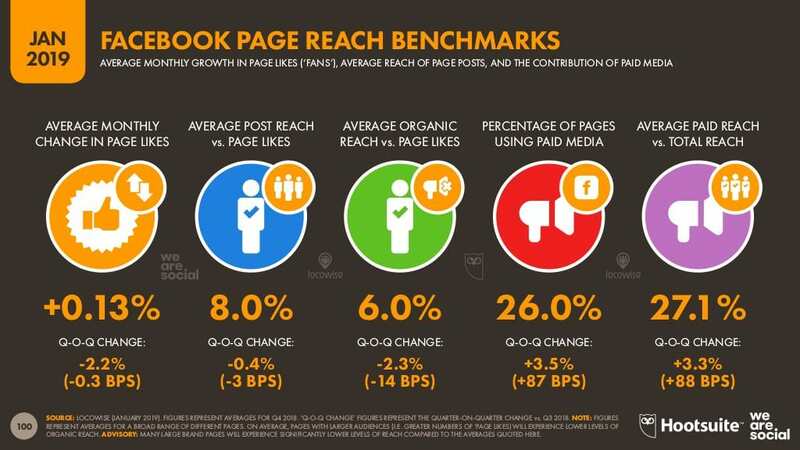 What are the different interaction rates in social media? TrackMaven analysed 51 million posts from 40,000 different companies over 130 industries to establish which social networks achieve the greatest engagement per follower. 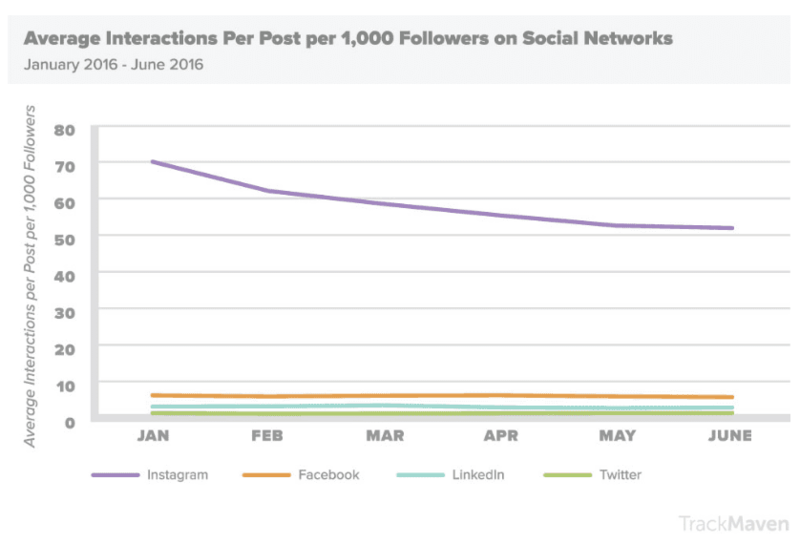 The results show that Instagram absolutely dominates when it comes to interactions per 1,000 followers. 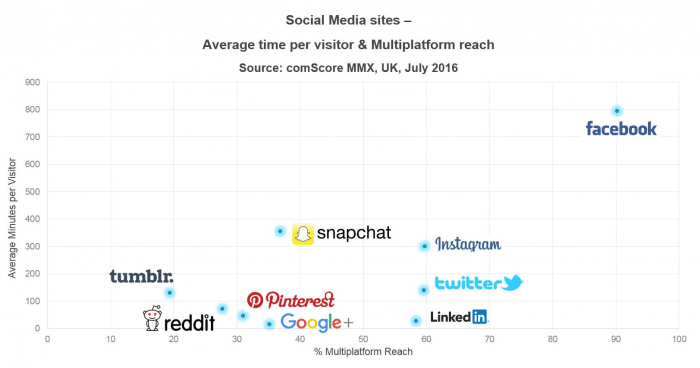 In fact, it is so much higher than the other channels we've had to include a second chart just to show the difference between Facebook, LinkedIn and Twitter! 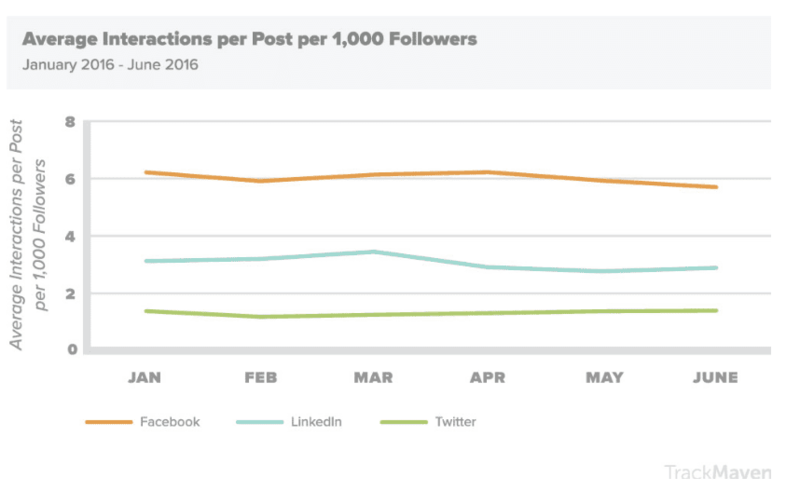 As you can see, Instagram dominates, but when it comes to the other networks Facebook has a considerable lead on Twitter and LinkedIn. This is in large part because people tend to post a lot more on Twitter because it doesn't have an algorithm that only serves posts to a small section of an audience. This has turned Twitter into a bit of fire hose of content where companies have to share more and more often to be heard through the noise. This has resulted in lower engagement per post. 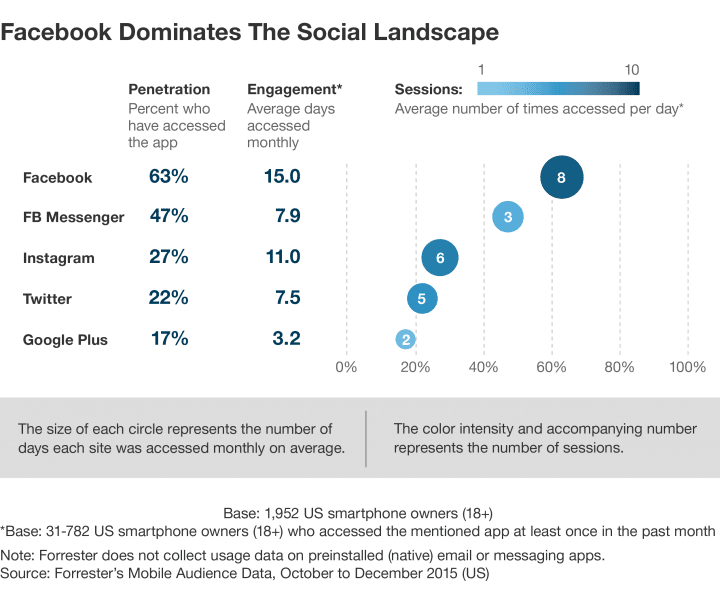 US consumer technology adoption specialists Pew Research Center released a new set of data on US Social Media US on October 8th which shows the latest social media trends and how far it has permeated society. Looking at data from the past 10 years, it charts the meteoric rise of social media. 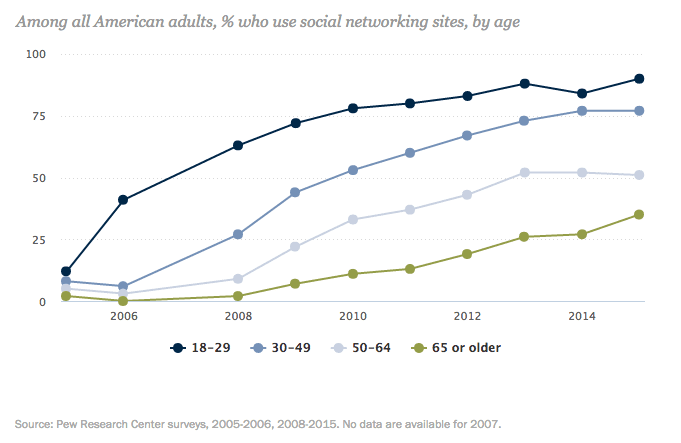 10 years ago on 7% of the US population used one or more social networking sites. Now that figure has increased almost tenfold, to 65%. 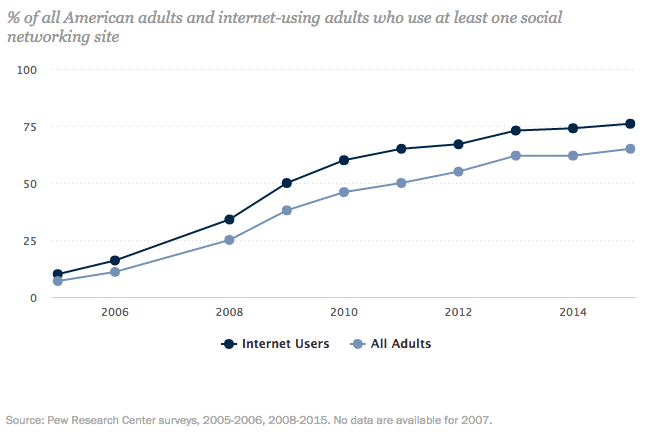 Of those who use the internet a massive majority of 76% of American's use social media. Social Media has grown massively, but it's growth is now starting to plateau. Interestingly the over 65s segment are now driving growth, as other age groups have plateaued completely and use is hardly growing it all. Among the 50-64 age cohort, use hasn't increased since 2013. This is a great visualisation of the popularity of social networks based on the interviews in the GWI report. If you pick out your country it's probably way behind the countries in which these four core social networks are most popular. Indonesia, Philippines, Mexico, India and Brazil are in the top 10 for each with significantly higher levels of use than the US, UK and European countries. This chart is striking for the similarity of usage across different age groups. It shows that the social networks are now at a stage of maturity where they give opportunities to reach all age and gender groups. The exceptions to this are Instagram and Tumblr which are clearly popular with younger age groups.